Two years have passed, and our "infant inconvenience" has started to toddle in the fifth and final 'Parasol Protectorate' book, Timeless. 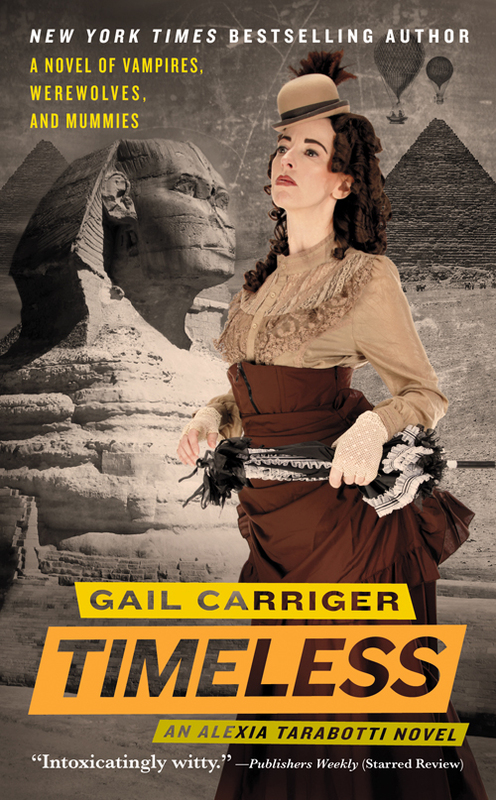 Note: Timeless, is the fifth book in the 'Parasol Protectorate' series. The review of the first book, Soulless, is here; and the review for the fourth book, Heartless, is here. Otherwise, read on! In the last two years, our cast of characters has grown and matured, at least a bit. Ivy Tunstell has made a name for herself on the stages of London, and has twins to boot. Biffy has been standing in for Miss Lefoux at the hat shop, as well as finding his place within the Woolsey pack. Alexia has become accustomed to living out of one of Akeldama's closets, and while she leaves the daily business of raising Prudence to the drones and nurse in typical Victorian fashion, she dose certainly have more of a connection to her daughter than many had feared. This is probably because, instead of supernatural or a preternatural, Prudence is in a class all of her own. She takes on the 'soul' of whatever preternatural she touches, turning them temporarily human. This might not sound so bad, until you realize that she takes on the traits of that being, as well. And not surprisingly, a werewolf puppy in full fur can be quite a handful. Helping Lord Akeldama raise this bundle of joy isn't all that the Maccon household is dealing with. Alexia receives a rather mandatory 'invitation' to Egypt to see the world's oldest vampire. It turns out that the existence of Prudence has finally made it to all corners of the world, and since vampires can't leave their hive, she'll just have to bring the little bundle of joy to her. It can't be public knowledge why the Maccons are going to Egypt, though. Too much messy politics there. So they need a cover. Hmm...Ivy's theatre troupe has just debuted a new play in London, perhaps they would like to tour? But of course a dirigible trip to Egypt.wouldn't be enough to keep our band of preternaturals busy. You see, secrets have a way of getting out, especially among family. And what is a Pack or a Hive but a great bit, dysfunctional family? So now that Professor Lyall's secret role in the ouster of Woolsey Pack's Alpha is out, it would only be a matter of time before it made its way back to the Pack. And their new Alpha is not happy about that in the least. From there, in the manner of the preternatural set, all hell breaks loose. As a fan of the series from the beginning, I'm sad to see this crew retired. Our characters have grown so much, in their own ways. But of course, some things will never change as well. Ivy may be a married woman with twins and a career on the stage, she'll always have a penchant for the atrocious hats and somehow find herself in the most ludicrous play, complete with an interpretive dance scene. Biffy may finally be accepting of his new preternatural status, but he'll always be the most proper, well-dressed werewolf he can manage. Lord Akeldama, while he certainly never imagined he'd be raising a little soul-stealer and even give up two of his best closets in the process, will always be Lord Akeldama. Some people might say that the series has devolved to a silly farce of a book. We have werewolves shacking up, a toddler who turns into a bounding werewolf pup at the drop of a hat, and an acting troupe putting on a play only Ivy Tunstell could dream up. But really, how is that any different than Alexia hanging off the side of a dirigible in mid-flight or an eight-legged steam vehicle going after the Hive Queen of London? The readers who balk at the silliness or plot contrivances of this volume simply haven't been paying attention thus far. While this may be the last we see of this cast of motly characters, it's likely not the lawst we'll see of the Parasol Protectorate in one form or another. Yen Press is releasing the Soulless manga in the US, and a list of forthcoming books by Carriger shows a book series entitled 'Parasol Protectorate Abroad' with a tentative Fall 2013 release date. Until then, keep hold of your parasol, because scarves seem to be in this season. Highs: The reception that Ivy's play keeps receiving is very...generous, to say the least. Lows: I would have loved to have seen Prudence and Ivy's twins interacting more. Verdict: A fitting conclusion to the series, but it still leaves enough questions open that a new series is necessary.